Managers are waiting for the boss. Businessmen meeting. Top view multiethnic creative team brainstorming in trendy modern coworking office. Female boss leads the meeting 4K. Happy female boss leading office team meeting. Multiethnic colleagues listening to boss directions, looking at chart 4K. African American woman leader motivates employees. Female boss leads and gives instructions at business meeting 4K. Female leader speaking at office team meeting. Young multiethnic people listen to work project manager's directions 4K. Caucasian female boss helping young multiethnic colleagues. Woman manager motivates employees in modern loft office 4K. 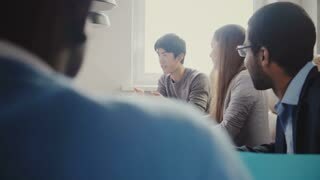 Young multiethnic colleagues listen to unrecognizable female leader giving instructions at office meeting slow motion. Confident young European female boss talks to multiethnic employees. Businesswoman leading office meeting by the table. 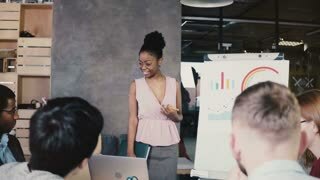 Happy young multiethnic employees listen to female boss giving directions at modern loft office corporate meeting. 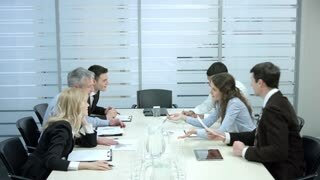 African American male boss leading multiethnic office meeting. 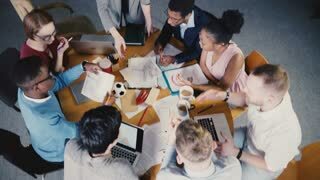 Young successful business people cooperate in coworking.